How Do Tomato Fertilizers Work? Gardeners continually strive to produce large, brightly colored and flavorful tomatoes …. but many struggle with how to achieve that goal. That’s where tomato fertilizers come in. Soil deficient in basic nutrients like nitrogen, potassium and phosphorous will produce straggly stems, yellowing and diseased leaves and small, misshapen and tasteless tomatoes. 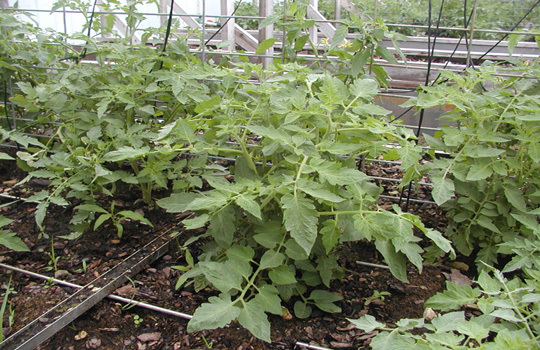 Correctly applied, tomato fertilizers restore necessary nutrient balance to soil, thereby promoting healthier growth and more disease tolerant plants which, in turn, results in better yields. Human harvest activities do allow the natural cycle of plant growth and decay to restore essential nutrients to the soil. This causes the soil to lose nutrients essential to healthy and productive plant growth. Tomato fertilizers provide an easy way for growers to reintroduce necessary nutrients like nitrogen, potassium and phosphorus levels to soil, and allowing growers to make the best possible use of limited land for the production of tomatoes. Key to achieving optimum production and yield of tomatoes is to maintain a correct balance of nutrients for the plant’s use. Whether natural or synthetic, tomato fertilizers are often applied incorrectly, resulting in an imbalance in the nutrients provided. For example, plants lacking phosphorus produce dark green, leathery leaves, few blooms and show overall stunted growth; too little potassium will often result in smaller plants and dropping leaves. Too much nitrogen will burn the plant and too little will result in yellow, sickly plants. Overuse results in runoff to waterways, degrading water quality. Improper application of fertilizer can cause loss to the grower in time, quantity and quality of crop and money. Fertilizer boosters help fertilizers work more efficiently, therefore allowing for a reduction in the amount needed by the grower to achieve optimum results. Stronger, healthier plants with less fertilizer use translate to less impact on the environment and the grower’s budget. Through the process of Cationic Exchange (CE), BioWash actually aids the plant’s growth process at the molecular level, helping to enlarge and strengthen root and plant stalks so they are better able to absorb available nutrients and moisture more efficiently. It also increases BRIX (sugar content) in the plant, which has been found to aid in insect control and in promoting sweeter tomatoes. 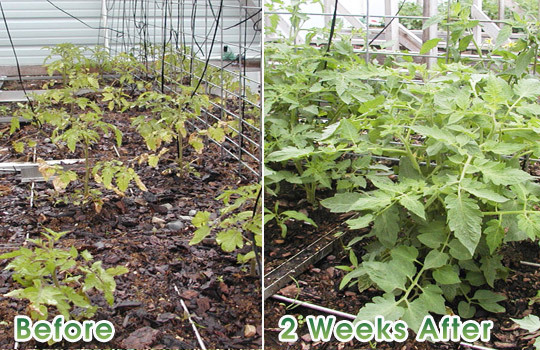 BioWash found to make plants more cold resistant (down to 27 degrees), further assuring productive, healthy tomato plants. The added efficiencies reduce the amount of fertilizer needed by growers and therefore minimizes the risk of over application of chemicals to the environment. Better growth, higher yields, sweeter fruit, fewer chemicals, at less cost. Doesn’t get any better than that!